Brilliant to see you've focused on more realism that an actual game. Cant wait to play it. One question, will there be a fracture clinic for broken bones? and are you only focusing on ankle fractures or will there eventually be more? I am hoping to see departments such as Maternity I really think that can be a big game changer. And to a lesser extent things like Nephrology, Ophthalmology and Oncology. I'm a huge fan of management en building games and i just love the clean and simplistic infographic. Just wondering. 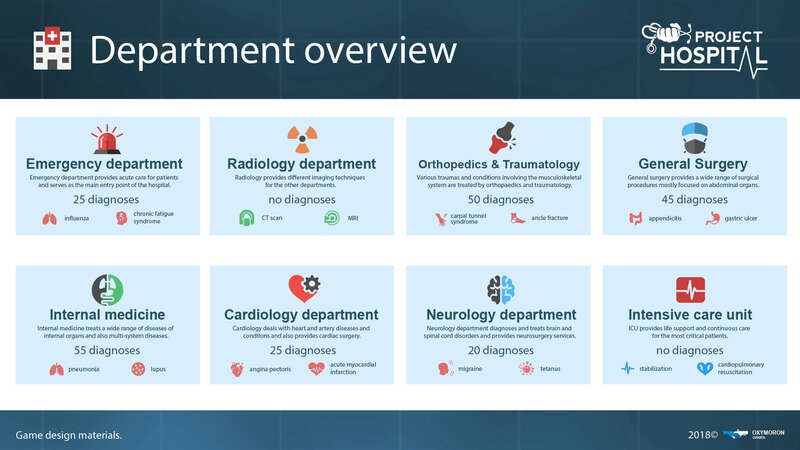 Are the number of diagnoses in the infographic the amount of patients in that department? And the symbols below the diseases they are suffering? Denimco wrote: I'm a huge fan of management en building games and i just love the clean and simplistic infographic. Hello, the numbers represent amount of possible diagnoses for each department, not the patients - amount of patient on each department depends on various factors - mainly from the contracted insurance companies..